In 2018, as always, IWPS spent September – December supporting Palestinians in Salfit, Northern West Bank, during the olive harvest. 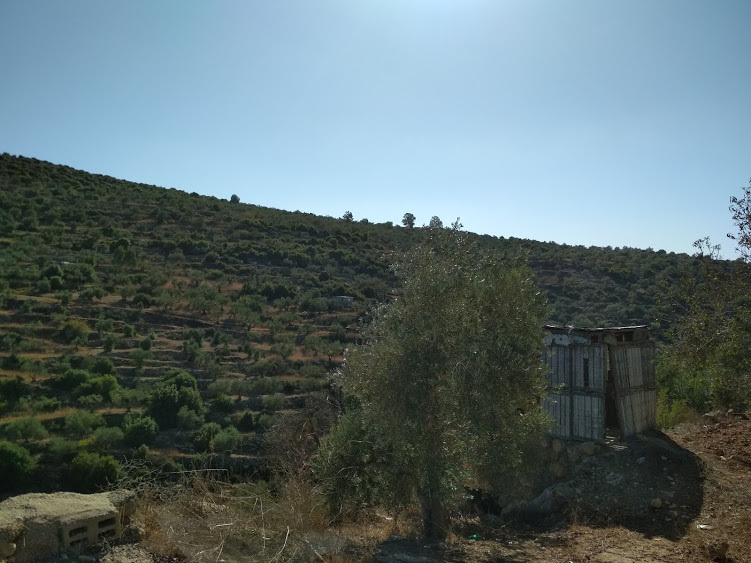 As we spent our days picking olives with numerous families across the region, I began to understand that the olive harvest means much more to Palestinians than simply the act of harvesting their crop to generate income. 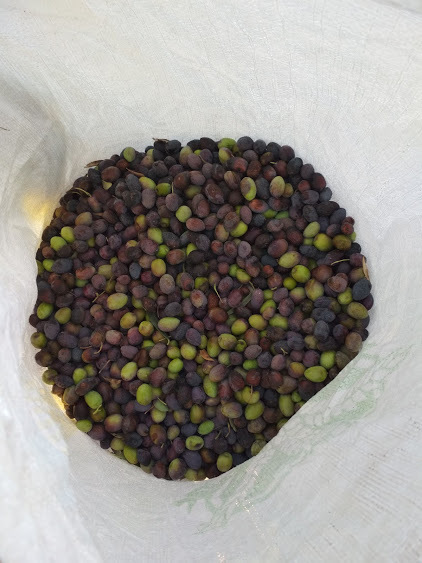 The olive harvest is traditionally more of a celebration, a time when family members, neighbours and friends gather together to help each other try to pick as many olives as they can before the season is over. Drinks are provided – coffee followed by tea, followed by coffee followed by tea. All with cake and biscuits, and no you cannot refuse these. 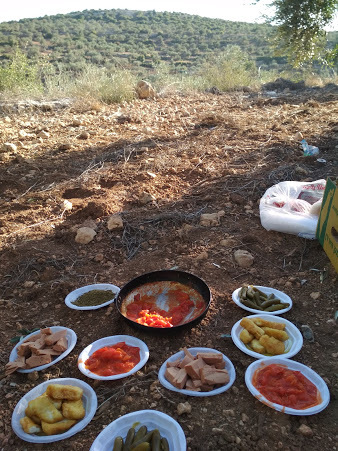 ‘Futor’, or breakfast, is an amazing medley of food that is either made there in the fields on small fires made of wood, or home-made by the families, including zaatar, honey and bread. Music is played on phones or speakers, jokes and stories shouted across the trees in Arabic, and tractor rides back from the fields include singing and playing drums. Many Palestinians told us that when they are on their land with their olive trees, this is when they feel the most happy and calm. Others who have left their villages and farms and now reside in the cities, told us how they still enjoy going back to their village at the time of the harvest to help their families with the olive harvest, or just to be there when the olives are being picked. What I came to realise as the days went on, is that this celebratory atmosphere was dying out. We were picking with families who own land that has been taken by Israeli ‘settlers’ to build colonies in the West Bank illegally. Whilst harvesting olives from the trees that remain on the land they are still allowed to access, these families are often very close to or surrounded by settlers and the ‘security’ apparatus of the colonies – soldiers, ‘settlement security’, fences, checkposts. The closer we were to one of these colonies, the more tense and hurried the families were. Coffee breaks were fewer and further between. Instead of the usual relaxed lunches, we would only take a short break in a full day of picking. No-one played music and sometimes only spoke in hushed voices. There were various reasons for this. Some families had to obtain a permit from the Israeli authorities in order to harvest their own lands. For some, this limited the days they could pick to a very short time, and they were keen to get as many trees completed as they could whilst they had extra hands to help. For others, the cause for the rush and tense atmosphere was the ever-present possibility of an attack from residents of the nearby colony. This wasn’t paranoia, and the experience of the Taha family shows this. Mohammed Taha called our IWPS co-ordinator around 10pm one Sunday evening. He was in a state of distress – he, his wife and their very young children, had been attacked that day by settlers. A group of youths on a horse came into their fields, threw stones at the family, and told them if they dared to return to pick their olives, they would be killed. The family contacted ‘settlement security’ and the army asking for protection, but they were told nothing can be done to control the youths and that they had to leave their fields. We joined the Taha family the next day. They were jumpy – a coat moving in the wind startled one of the family, and others were nervous to pick trees next to the edge of the road where the boys had attacked them from the previous day. The boys did come back, and so did ‘settlement security’, but luckily the presence of internationals was enough to keep them away for long enough to allow us to help the Taha’s and their relatives to complete their harvest. The proximity to colonies, violence and threats from ‘settlers’, and the restrictions placed on farmers by Israeli authorities have changed the olive harvest. Many families seemed to be in a rush to get it over with, to finish rather than to enjoy the experience, never knowing what the situation will lead to the next day or next year. General violence against Palestinians by settlers is on the rise, as is violence to property and people during the olive harvest and ploughing season. 5,582 olive trees were destroyed by settlers in the 2017 harvest- more than double the previous year. Settler violence goes unpunished by the Israeli government, and should be seen as part of a wider strategy to obtain more land for settlements. If Palestinians are too afraid to cultivate or access their fields, these will be declared as unused and taken by the Israeli state to build settlements on. 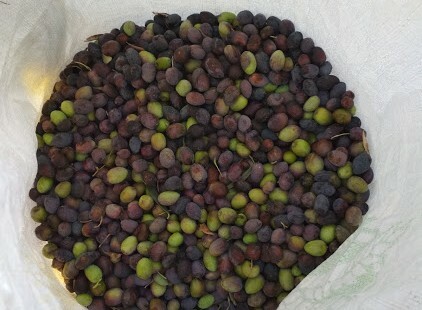 It is more important than ever for internationals, and the international community, to help Palestinians to feel able to harvest their olives. I hope that one day, they will be able to enjoy it again too. ← Visit historic Deir Istiya!